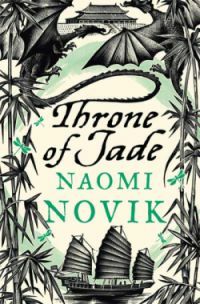 Did I enjoy Throne of Jade as much as its predecessor, Temeraire? If anything, I enjoyed it more. I loved it so much that yesterday I made my ever patient boyfriend drive me to a city nearly two hours away so I could purchase the next two books for twice the price than if I got them from Book Depository, because I want to read them right now, not in 7-15 days! Reviews of those two will be forthcoming, I'm sure, but for now let's talk Throne of Jade. (Probably you should read Temeraire before you read this). The plot is basically this: China wants Temeraire back, preferably sans Laurence. So it's off to China with Laurence and Temeraire, where they hope to convince the emperor to let Britain keep Temeraire. Let me first point out a two ways in which I think this book could have easily faltered. First, the depiction of the Chinese and their culture was of course going to be tricky, especially considering that our POV man, Laurence, it not favourably disposed to the Chinese AT ALL. (The are trying to remove him from Temeraire's company, after all). But Novik does a good job of contrasting China to Britain and highlighting how strange everything is to the Western characters without ever sinking into, 'gosh, look how silly these Chinese people are!' Some of the Chinese characters are portrayed negatively, but its never because they are Chinese. The insertion of Dragons into Chinese culture also felt very authentic, and far more natural than the British dragons in book one. The second trap that I am glad Novik avoided is a common trope in books like this. Almost every character in this book is devoted to separating Laurence and Temeraire. How easy it would have been, and how predictable, to have a miss-communication or misunderstanding that does indeed separate the two, until they triumphantly overcome the obstacle. Yawn yawn yawn. The relationship between Temeraire and Laurence in this book is deeper than that trope (which I hate, without exception). There is a moment where it could have come into play; Temeraire is inexplicably absent when Laurence desperately needs him. But, but, wait for it, Laurence gives Temeraire a chance to explain and, oh my god, get this, Temeraire explains! Wow! It was very gratifying to see Laurence and Temeraire's relationship develop. In the first book there was definitely a feeling that Temeraire was a child and Laurence an adult, but as Throne of Jade plays out we see the two slowly become equals. Temeraire starts to establish who he is outside of Laurence and, instead of seeing this as some kind of abandonment, Laurence is supportive. What I'm saying is that one of the most realistic and healthy adult relationships I have ever encountered in fiction is here, between a man and his dragon. The plot, while I may have made it sound simple, is very exciting. Storms, sea serpents and murder attempts abound, and unlike in the previous book there is quite a few character deaths. There was also a fight between two dragons, which played out very differently to the multi dragon battles we’ve already seen and was a thrill to read. Ultimately I felt that this book nimbly sidestepped the potential pitfalls that faced it, and has left even more eager to continue reading the adventures of Laurence and Temeraire. Here's a preview of the new Tenemeire book!